Don’t worry. She fell in love with him anyway, and a few years later, Erik married that girl: my dear friend Amy, who moved to Sweden to be with him. Lucky for me! It was only after visiting them last week that I discovered a wonderful Swedish pastry called semlor. 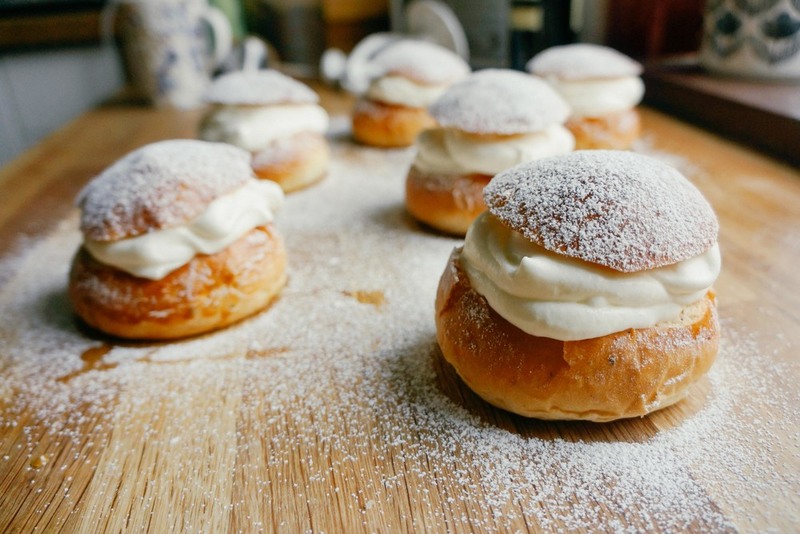 Semlor are gorgeous cream buns ubiquitous in Sweden at this time of year. Traditionally they’re eaten on Fat Tuesday, but if I could, I’d make everyday fat with one of these guys. Imagine a very lightly sweetened, cardamom-scented bun, filled with a few spoonfuls of creamy almond paste and topped with a generous swirl of fresh, whipped cream. Semlor don’t have a lot of bells and whistles and they aren’t overly sweet or overbearing. They rely instead on straightforward, mouthwatering flavors. Simple and beautiful. After Amy and I binged on semlor one fika (what the Swedish call afternoon tea, which is a real part of daily life -- Sweden, you just keep racking up the points!) I decided to try my hand at making a batch from scratch. We did a little research in some of Amy’s Swedish baking books, and then I went to work on my own version. The rolls I made are soft and inviting, not nearly as rich as a brioche or the like, but tender and fragrant. The almond filling is just a humble combination of ingredients but packs a flavorful, swoon-worthy, frangipane punch. Some recipes we found add some of the crumbs from the buns to bulk up the filling. I kept that step optional. I like the strong, almond flavor of just paste and milk blended to a creamy consistency. If you find the filling overwhelming on it’s own, adding a handful of crumbs will chill it out a bit. You can also decide whether or not to sweeten the cream. I love the pure, sweet dairy flavor of whipped cream without sugar. The most important step is deciding how to eat a semla (the singular of semlor). The traditional way to indulge in Sweden is to sink a semla in a bowl of warm milk. That's called hetvägg, which means “hot wall.” Is that not the coziest thing imaginable? Erik eats the semla lid first, making the whole pastry more manageable, and then picks up the bottom half with his hands. Amy prefers to daintily dig into her semla with a spoon, keeping her hands nice and clean. I like to pick up the entire beast, towers of billowy cream and hat neatly in place, and try to get the whole thing into my mouth, like a big burger. It’s messy but it feels right to me. Little Semla, I'm so glad we found each other. Tack så mycket, Sweden. 1. Make the dough: In a small saucepan, combine milk and butter and melt over medium heat. Watch closely to ensure milk doesn’t boil over. Let mixture cool to 105° to 110°. It should be just warm to the touch. 2. In a stand mixer fitted with the paddle attachment, combine milk mixture, sugar, yeast, and egg. With mixer on low, add 2 cups flour, cardamom, then salt. 3. Switch to the dough hook and add 1/2 cup flour with mixer on low. Slowly add up to 1/4 cup more flour if necessary, 1 tablespoon at a time, until the dough is smooth but sticky. The dough should still be a little wet and you may not need the entire 1/4 cup flour. With the mixer on low, knead the dough for 5 minutes. 5. Turn the dough onto a very lightly floured surface and knead it a few times. Divide the dough into 12 equal pieces. 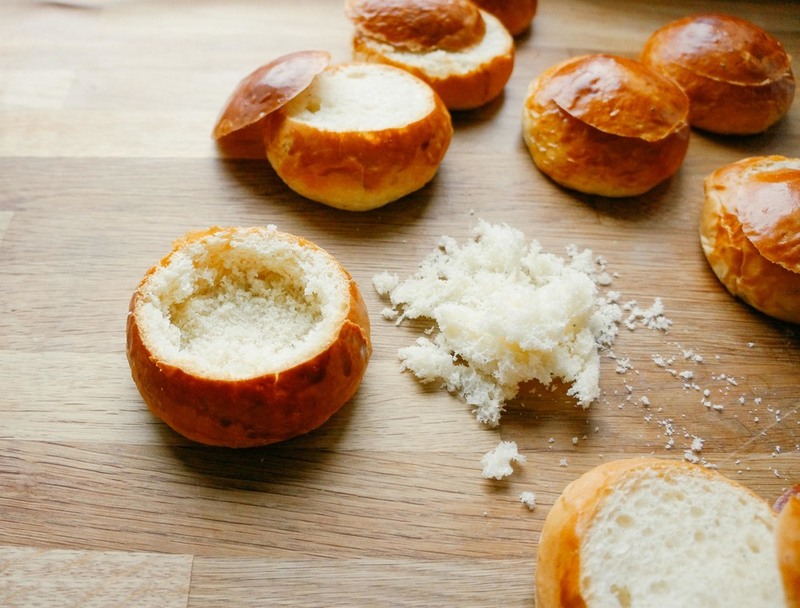 Roll each piece into a tight ball by cupping your hand over the dough and moving it in a circle with the fingers of that hand tucked slightly under like a claw. Making a neat tight ball is important to give the finished rolls a nice shape. Divide the balls between two, parchment-lined baking sheets. Cover lightly with plastic wrap. Place the sheets in a warm spot until the balls have doubled in size, about 1 hour. 7. Preheat oven to 375°F. In a small bowl, whisk together egg yolk and 2 teaspoons water. Lightly brush the tops and sides of the balls with egg wash. Bake until golden brown, 18 to 20 minutes. Transfer rolls onto a wire rack and let cool completely. 8. 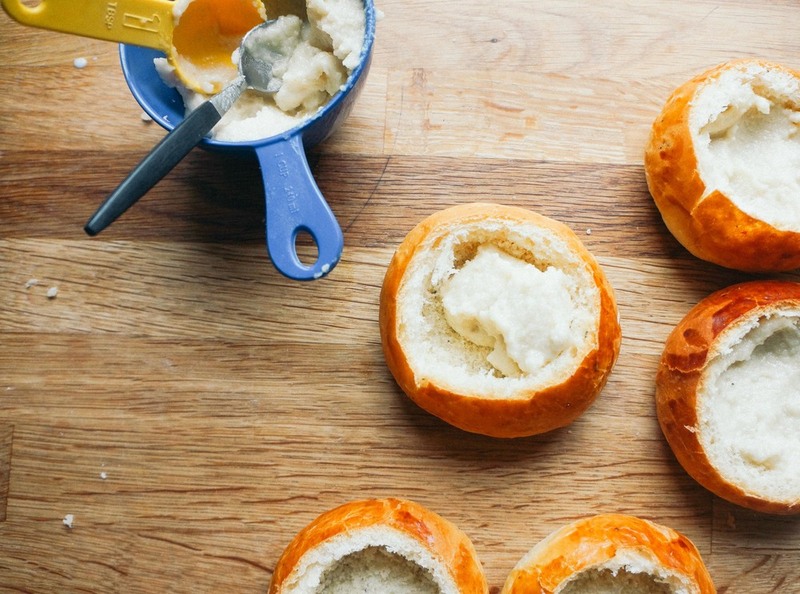 Once the rolls are completely cool, use a serrated knife to cut off the top third of each bun. Pull out some of the center of each bun to make room for the filling. Reserve bun crumbs if you’d like to use them in the filling. 9. Make the almond filling: In a food processor, process almond paste with milk until smooth. Add bun crumbs, if using, and process until smooth. 10. Assemble the buns: Whip the cream and confectioners’ sugar (if using) to medium-soft peaks. Fill each bun with two to three tablespoons of the almond filling and a generous scoop of whipped cream. Top with the bun lids and sprinkle with confectioners’ sugar.